« Small World Realms – To score more, keep digging! Small World Realms – Available for Pre-order! The Small World Universe is expanding beyond its borders with Small World Realms, a big new expansion that features scores of puzzle-like geomorphic Terrain tiles that assemble into countless different board maps. With Realms, the very ground your fantasy races walk upon is shifting under their feet! These new maps serve as the battlegrounds for a dozen different preset Scenarios created by the game’s designer, Philippe Keyaerts. You’ll find Scenarios appropriate for both Small World novices and Small World Underground veterans alike, with most of them customized for a varying number of players and many scaling well for up to 6 players! Perhaps even more exciting… you can become the master of your own Small World universe by combining terrain to build your own custom maps and scenarios. Small World Realms is the definitive world-building toolkit for Small World and Small World Underground fans. 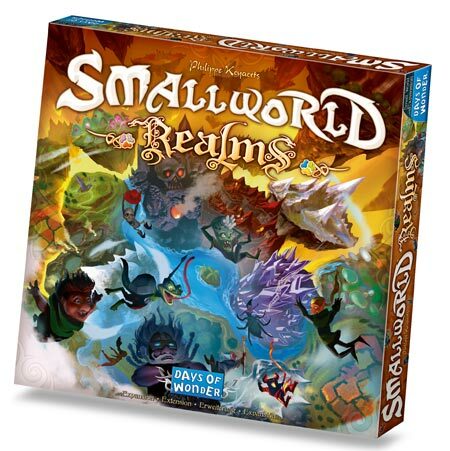 Small World Realms will be available from the Days of Wonder webstore and from better game stores throughout Europe in June and in North America in early July. Pre-order your copy now! This entry was posted on Tuesday, May 8th, 2012 at 15:02 and is filed under Games, News, Small World. You can follow any responses to this entry through the RSS 2.0 feed. Both comments and pings are currently closed. Copyright ©2002-2019 Days of Wonder Inc.